Driven by purpose and perfectionism. Our unique approach to design will truly make a difference in how you’ll sleep. Built unlike anything else, our memory foam mattresses don’t sleep hot, are eco-friendly and won’t let you get stuck in bed - guaranteed. We want you to enjoy your nights, not dread them. Minimized our impact. Maximized your comfort. Memory foam is comfortable but not known to be eco-friendly. We changed that by crafting our beds with plant-based materials, allowing us to use less petroleum in our products. We’re forging forward with new technology that makes our mattresses more comfortable while still being eco-friendly. Not stuck with the norm. We always keep innovating while others are pushing outdated and outclassed technology. Our unique process allows us to make memory foam that contours and supports while not allowing you to sink and feel trapped - guaranteed. Cooler sleep in a fresh way. We’ve designed our mattress for maximum breathability so you’ll stay cool and comfortable through the night. Our Bio-Pur® memory foam has an extreme open cell structure that lets air move while you’re in bed. It’s a fresh way of getting to sleep. Beyond making you comfortable, we want you to get the deep, restorative sleep that will keep you alert and energized during the day. That's why we offer a 100-Night Trial and money-back guarantee. We also use Celliant® in our mattress covers, an advanced fabric that the FDA determined1 helps increase comfort and promotes more restful sleep. 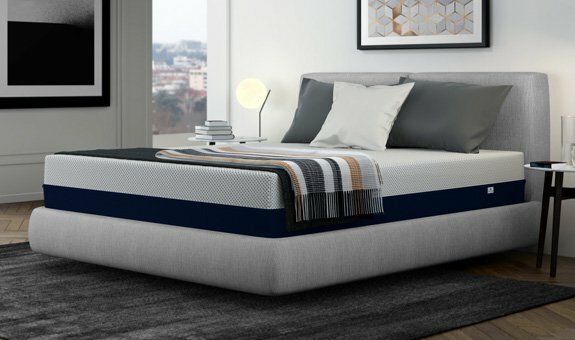 Find which mattress is right for you. 1 The FDA has determined that Celliant® products are medical devices as defined in section 201(h) of the Federal Food, Drug and Cosmetic Act and are general wellness products. Celliant® is determined by the FDA to temporarily promote increased local blood flow at the site of application in healthy individuals. Hologenix, LLC, the maker of Celliant®, states that Celliant® safely converts body heat to infrared energy. This energy penetrates into the muscle and tissue to promote a temporary increase in local blood flow and helps increase comfort and promotes restful sleep.